Our Moon is the one major natural satellite of the planet Earth. Although it is the fifth largest moon in the solar system, it is the largest, relative to the size of the planet it orbits. At a diameter of 2160 miles, it is over one quarter the size of Earth. It weighs in at 81 million million million tons and is the second densest of all the solar system's moons (Jupiter's moon Io being the densest). The Moon orbits the Earth at a distance that varies between 221,457 and 252,712 miles. It is in so-called "synchronous" rotation, meaning it rotates at such a speed that, as it orbits, this rotation keeps one side always pointing at the Earth. This is known as the "near side". The side we can't see, even though it's often referred to as the "dark side", is more properly known as the "far side". Unlike most other moons, which orbit their planet along the plane of its equator, our Moon's orbit is tilted slightly, by 30.12 degrees, relative to Earth. As the Earth itself has an axial tilt of 23.44 degrees, the Moon's actual orbital tilt, relative to the plane of the solar system, is 6.68 degrees. Notice the "Barycenter" in the above diagram? This is the joint centre of mass of the two celestial bodies and is situated just over one thousand miles beneath the Earth's surface. The significance of this is that it discounts the theory proposed by some astronomers that the Moon and Earth is (or was) a twin planet system. For a true twin planet system, the barycentre has to be situated somewhere in the space between the two objects. Similarly to the Earth, our Moon possesses a crust, mantle and core. 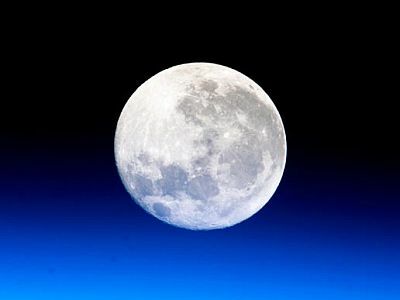 Research has indicated that the Moon's crust is around 30 miles thick on the near side. The far side, on the other hand, has a crust nearly twice that. It is composed mostly of anorthosite, which is a type of igneous rock. 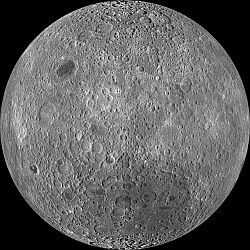 Prominent features on our Moon's near side are the so-called "seas", large flat plains, formed by lava flowing up from the mantle beneath. These areas, therefore, tend to be more rich in basalts. Elements present in the crust include oxygen, silicon, iron, magnesium, iron, calcium and aluminium, with traces of hydrogen and heavier ones, such as uranium and titanium. Occupying, by far, the largest volume of the Moon's interior, the mantle is some 435 miles thick. It is extremely rich in iron and, as it approaches the centre of the Moon, becomes liquid. 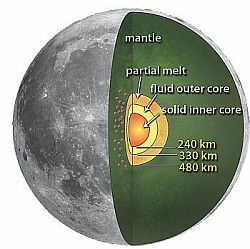 Like Earth, the Moon's core is divided into two sections, the inner and outer. The outer core is in liquid form and consists of an iron-sulphur-nickel alloy. The inner core is believed to be pure iron and is solid. At just over 200 miles in thickness, the core is very small, compared to the size of the Moon. Occupying only one fifth of its volume, this contrasts markedly with most of the other major bodies of the inner solar system, where their cores typically occupy up to one half. 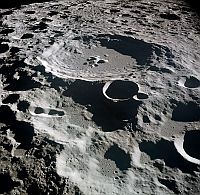 It is well known that our Moon is pitted with craters. It is thought that, in its early days, the surrounding solar system was a very violent place, with impacts occurring by the second. As the Moon has no atmosphere or weather, all the craters from these collisions have not been eroded away and can still be seen today. They vary in size from several hundred miles across to around a micrometre (trust me, that's very tiny). The largest crater on the Moon is on its far side. Named the South Pole-Aitken basin, it is just over 1390 miles across and about eight miles deep. The large crater in this image is called Daedalus and is about 58 miles across. Also found on the far side, it was photographed by the crew of Apollo 11. When you look at the Moon in the night sky, you can easily make out light and dark areas. The light bits are mountainous areas and contain peaks as high as Mount Everest. Some of these mountains form ranges, but are generally found circling craters. The dark bits are "seas", or, to use the Latin word, "maria", which is the plural of "mare". As stated earlier, these form from lava bursting through the crust and spreading out. It is a curious fact that the far side has no "maria" to speak of. As is the case with so many things in astronomy, how the Moon came to be orbiting Earth is still only a theory. Prior to the currently accepted theory, there have been a few others, all eventually dismissed as implausible. One proposed that, in Earth's early existence, it was spinning so fast that a huge portion of its crust was thrown off into space, to then coalesce as the Moon. It was even suggested that this ejected crust resulted in the formation of the Pacific Ocean's basin! In other words, if you brought the Moon to Earth and sort of packed it into that immense dip in the Earth's crust, it would completely fill it. Believe it or not, this theory was the prevailing one until well into the 20th century, until scientists decided that such an event would have destroyed the Earth in the process. Another idea is that the Moon happened to be drifting by the Earth at just the right speed to be captured by the planet's gravity. This was dismissed as too unlikely as a moon captured this way would probably break up. 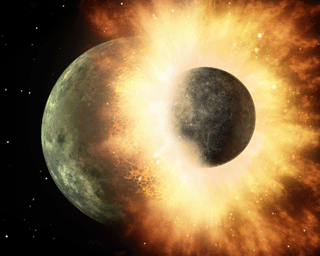 Yet another proposed that the Earth and the Moon were both formed at the same time from the nebula that created our entire solar system and ended up with one orbiting the other. This, also, has been dismissed, as two such celestial bodies would probably have ended up fusing together. So, what's the prevailing theory? It's called the Giant Impact Theory and simply postulates that, around 4.5 billion years ago, the young Earth was hit by a large object, about the size of Mars. The resulting debris from this ended up in orbit around Earth and it eventually came together to form the Moon. There were still certain problems connected with this theory, such as the comparative compositions of the Moon and Earth. They were pretty similar, so where did the traces of the other body in the collision go? Why does the Moon have such a small iron core? And so on. Currently a suggestion has been made that the situation started out with two similar sized planetoids, around half the size of Earth, which then collided. From this event came the Earth, at its present size, with the Moon, very much the loser, ending up a lot smaller. As Earth and Moon would have effectively been created from the same material, this accounts for the composition of the two celestial bodies being so similar. The Moon is gradually moving away from Earth at a rate of about 4 cm per year. (This can be measured very accurately by firing lasers at the mirrors left on the Moon by the Apollo astronauts.) 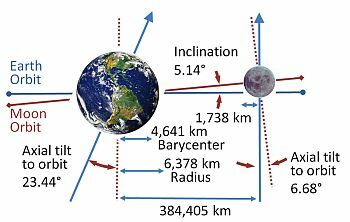 The reason for this increase in distance is the fact that the Moon and Earth are gravitationally linked and the Earth's rotational momentum is gradually being transferred to the Moon's orbital momentum. This results in the Earth's rotation speed slowing down and the Moon's orbital speed quickening. A faster orbit equates to a higher orbit. The Earth's days will gradually become longer and longer and, when equilibrium of momentum is reached, one Earth day will be the same as one Earth month - about 47 days. The Moon will, at this point, stop moving away and will be 35% further from Earth than it is now. Fortunately, this won't happen for billions of years.